Secure Personal Medication Management for all Patients. Help Prevent Medication Errors and Keep Medication Safe. 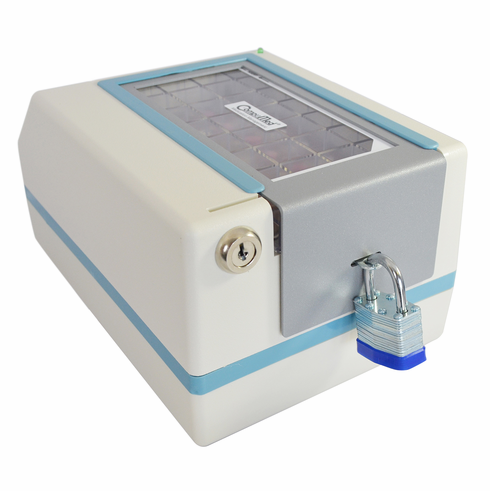 The e-pill CompuMed PLUS Automatic Weekly Dispenser is a Tamper-Resistant, locked reminder System for tablets & capsules. It works well for patients on pain medications or Class II / Class III narcotics and is often used in Drug Rehabilitation Programs. This version has a security lid for extra tamper-resistance. It is simple to use: they simply pull out the drawer and take the medication. The alarm will automatically stop. CompuMed dispenses dry oral medications (pills, tablets, caplets, etc.) and displays important instructions (text messages on the screen) for all your medications. CompuMed needs an A/C outlet. Set-Up: Pills are loaded into a tray that slides into the top of the device. The tray is locked into position using a key. A metal security lid is then placed on the medication tray after the medication has been loaded. The lid is locked into place with a padlock, further preventing users from accessing medication. The time of day and alarms are set up using the buttons on the front of the unit. Alarms will auto-repeat at the same time every day. How it Works: When it is time for the patient to take their medication, the alarm will sound & pills will fall into an easily accessed drawer. The patient will pull out the drawer and take the pills. All other medicine is inaccessible. The alarm is automatically turned off as soon as the drawer has been pulled out of the device. Capacity: 25 aspirin sized tablets per dose. Maximum four (4) Doses per Day. Each pill compartment is 25 mm x 25 mm x 25 mm. Medication tray holds 4 doses per Day x 7 Days.